Antares (/ænˈtɑːriːz/), known during early development as Taurus II, is an expendable launch system developed by Orbital Sciences Corporation (now part of Northrop Grumman Innovation Systems after Northrop Grumman acquired Orbital ATK) and the Yuzhnoye Design Bureau to launch the Cygnus spacecraft to the International Space Station as part of NASA's COTS and CRS programs. Able to launch payloads heavier than 5,000 kg (11,000 lb) into low-Earth orbit, Antares is the largest rocket operated by Orbital ATK. Antares launches from the Mid-Atlantic Regional Spaceport and made its inaugural flight on April 21, 2013. NASA awarded Orbital a Commercial Orbital Transportation Services (COTS) Space Act Agreement (SAA) in 2008 to demonstrate delivery of cargo to the International Space Station. For these COTS missions Orbital intends to use Antares to launch its Cygnus spacecraft. In addition, Antares will compete for small-to-medium missions. Originally designated the Taurus II, Orbital Sciences renamed the vehicle Antares, after the star of the same name, on December 12, 2011. The first four Antares launch attempts were successful. During the fifth launch on October 28, 2014, the rocket failed catastrophically, and the vehicle and payload were destroyed. The failure was traced to a fault in the first stage engines. After completion of a redesign program, the rocket had a successful return to flight on October 17, 2016, delivering cargo to the ISS. The NASA COTS award was for US$171 million and Orbital Sciences expected to invest an additional $150 million, split between $130 million for the booster and $20 million for the spacecraft. A Commercial Resupply Service contract of $1.9 billion for 8 flights was awarded in 2008. As of April 2012, development costs were estimated at $472 million. On June 10, 2008, it was announced that the Mid-Atlantic Regional Spaceport, formerly part of the Wallops Flight Facility, in Virginia, would be the primary launch site for the rocket. Launch pad 0A (LP-0A), previously used for the failed Conestoga rocket, would be modified to handle Antares. Wallops allows launches which reach the International Space Station's orbit as effectively as those from Cape Canaveral, Florida, while being less crowded. The first Antares flight launched a Cygnus mass simulator. On December 10, 2009, Alliant Techsystems Inc. (ATK) test fired their Castor 30 motor for use as the second stage of the Antares rocket. In March 2010 Orbital Sciences and Aerojet completed test firings of the NK-33 engines. On February 22, 2013, a hot fire test was successfully performed, the entire first stage being erected on the pad and held down while the engines fired for 29 seconds. The first stage of Antares burns RP-1 (kerosene) and liquid oxygen (LOX). As Orbital had little experience with large liquid stages and LOX propellant, the first stage core was designed and is manufactured in Ukraine by Yuzhnoye SDO and includes propellant tanks, pressurization tanks, valves, sensors, feed lines, tubing, wiring and other associated hardware. Like the Zenit—also manufactured by Yuzhnoye—the Antares vehicle has a diameter of 3.9 m (150 in) with a matching 3.9 m payload fairing. The Antares 100-series first stage was powered by two Aerojet AJ26 engines. These began as Kuznetsov NK-33 engines built in the Soviet Union in the late 1960s and early 1970s, 43 of which were purchased by Aerojet in the 1990s. 20 of these were refurbished into AJ26 engines for Antares. Modifications included equipping the engines for gimballing, adding US electronics, and qualifying the engines to fire for twice as long as designed and to operate at 108% of their original thrust. Together they produced 3,265 kilonewtons (734,000 lbf) of thrust at sea level and 3,630 kN (816,100 lbf) in vacuum. Following the catastrophic failure of an AJ26 during testing at Stennis Space Center in May 2014 and the Orb-3 launch failure in October 2014, likely caused by an engine turbopump, the Antares 100-series was retired. Due to concerns over corrosion, aging, and the limited supply of AJ26 engines, Orbital had selected new first stage engines. The new engines were planned to debut in 2017 and allow Orbital to bid on a second major long-term contract for cargo resupply of the ISS. Less than one month after the loss of the Antares rocket in October 2014, Orbital announced that it would no longer fly Antares with AJ26 engines, and the first flight of Antares with new first stage engines would be moved up to 2016. In December 2014 Orbital Sciences announced that the Russian RD-181—a modified version of the RD-191—would replace the AJ26 on the Antares 200-series. The first flight of the re-engined Antares 230 configuration was October 17, 2016 carrying the Cygnus CRS OA-5 cargo to the ISS. The Antares 200 and 200+ first stages are powered by two RD-181 engines, which provide 440 kilonewtons (100,000 lbf) more thrust than the dual AJ26 engines used on the Antares 100. Orbital adapted the existing core stage to accommodate the increased performance in the 200 Series, allowing Antares to deliver up to 6,500 kg (14,300 lb) to low Earth orbit. The surplus performance of the Antares 200-series will allow Orbital to fulfill its ISS resupply contract in only four additional flights, rather than the five that would have been required with the Antares 100-series. While the 200 series uses the RD-181 by adapting the originally ordered 100 Series stages (Yuzhnoye SDO/Yuzhmash, Zenit derived), it requires under-throttling the RD-181 engines, which reduces performance. 2). Additionally, the company is working on trajectory improvements via a "load-release autopilot" that will provide greater mass to orbit capability. The second stage is an Orbital ATK Castor 30-series solid-fuel rocket, developed as a derivative of the Castor 120 solid motor used as Minotaur-C's first stage. The first two flights of Antares used a Castor 30A, which was replaced by the enhanced Castor 30B for subsequent flights. The Castor 30B produces 293.4 kN (65,960 lbf) average and 395.7 kN (88,960 lbf) maximum thrust, and uses electromechanical thrust vector control. For increased performance, the larger Castor 30XL is available and will be used on ISS resupply flights to allow Antares to carry the Enhanced Cygnus. The Castor 30XL upper stage for Antares 230+ is being optimized for the CRS-2 contract. The initial design of the Castor 30XL was conservatively built, and after gaining flight experience it was determined that the structural component of the motor case could be lightened. Antares offers three optional third stages: the Bi-Propellant Third Stage (BTS), a Star 48-based third stage and an Orion 38 motor. BTS is derived from Orbital Sciences' GEOStar spacecraft bus and uses nitrogen tetroxide and hydrazine for propellant; it is intended to precisely place payloads into their final orbits. The Star 48-based stage uses a Star 48BV solid rocket motor and would be used for higher energy orbits. The Orion 38 is used on the Minotaur and Pegasus rockets as an upper stage. The 3.9-meter (13 ft) diameter, 9.9-meter (32 ft) high fairing is manufactured by Applied Aerospace Structures Corporation of Stockton, California, which also builds other composite structures for the vehicle, including the fairing adaptor, stage 2 motor adaptor, stage 2 interstage, payload adaptor, and avionics cylinder. On January 14, 2016, NASA awarded three cargo contracts via CRS2. Orbital ATK's Cygnus was one of these contracts. According to Mark Pieczynski, Orbital ATK Vice President, Flight Systems Group, “A further improved version [of Antares for CRS2 contract] is in development which will include: Stage 1 core updates including structural reinforcements and optimization to accommodate increased loads. Previously, it was understood that these planned upgrades from the Antares 230 series would create a vehicle known as the Antares 300 series. However, when asked specifically about Antares 300 series development, Mr. Pieczynski stated that Orbital ATK has “not determined to call the upgrades, we are working on, a 300 series. This is still TBD.” In May 2018, Antares program manager Kurt Eberly indicated that the upgrades will be referred to as Antares 230+. The first two test flights used a Castor 30A second stage. All subsequent flights will use either a Castor 30B or Castor 30XL. The rocket's configuration is indicated by a three-digit number and a possible "+" suffix, the first number representing the first stage, the second the type of second stage, and the third the type of third stage. A plus sign added as suffix (fourth position) signifies performance upgrades to the Antares 230 variant. Originally scheduled for 2012, the first Antares launch, designated A-ONE was conducted on April 21, 2013, carrying the Cygnus Mass Simulator (a boilerplate Cygnus spacecraft) and four CubeSats contracted by Spaceflight Incorporated: Dove 1 for Cosmogia Incorporated (now Planet Labs) and three PhoneSat satellites – Alexander, Graham and Bell for NASA. Prior to the launch, a 27-second test firing of the rocket's AJ26 engines was conducted successfully on February 22, 2013, following an attempt on February 13 which was abandoned before ignition. A-ONE used the Antares 110 configuration, with a Castor 30A second stage and no third stage. The launch took place from Pad 0A of the Mid-Atlantic Regional Spaceport on Wallops Island, Virginia. LP-0A was a former Conestoga launch complex which had only been used once before, in 1995, for the Conestoga's only orbital launch attempt. Antares became the largest — and first — liquid-fuelled rocket to fly from Wallops Island, as well as the largest rocket launched by Orbital Sciences. The first attempt to launch the rocket, on April 17, 2013, was scrubbed after an umbilical detached from the rocket's second stage, and a second attempt on April 20 was scrubbed due to high altitude winds. At the third attempt on April 21, the rocket lifted off at the beginning of its launch window. The launch window for all three attempts was three hours beginning at 21:00 UTC (17:00 EDT), shortening to two hours at the start of the terminal count, and ten minutes later[clarification needed] in the count. On October 28, 2014, the attempted launch of an Antares carrying a Cygnus cargo spacecraft on the Orb-3 resupply mission failed catastrophically six seconds after liftoff from Mid-Atlantic Regional Spaceport at Wallops Flight Facility, Virginia. An explosion occurred in the thrust section just as the vehicle cleared the tower, and it fell back down onto the pad. The Range Safety officer sent the destruct command just before impact. There were no injuries. Orbital Sciences reported that Launch Pad 0A "escaped significant damage," though initial estimates for repairs were in the $20 million range. Orbital Sciences formed an anomaly investigation board to investigate the cause of the incident. They traced it to a failure of the first stage LOX turbopump, but could not find a specific cause. However, the refurbished NK-33 engines, originally manufactured over 40 years earlier and stored for decades, were suspected as having leaks, corrosion, or manufacturing defects that had not been detected. The NASA Accident Investigation Report was more direct in its failure assessment. On October 6, 2015, almost one year after the accident, Pad 0A was restored to use. Total repair costs were about $15 million. Following the failure, Orbital sought to purchase launch services for its Cygnus spacecraft in order to satisfy its cargo contract with NASA, and on December 9, 2014, Orbital announced that at least one, and possibly two, Cygnus flights would be launched on Atlas V rockets from Cape Canaveral Air Force Station. As it happened, Cygnus OA-4 and OA-6 were launched with an Atlas V and the Antares 230 performed its maiden flight with Cygnus OA-5 in October 2016. One further mission was launched aboard an Atlas in April 2017 (OA-7), fulfilling Orbital's contractual obligations towards NASA. It was followed by the Antares 230 in regular service with OA-8E in November 2017, with three further missions scheduled on their extended contract. Antares A-ONE, Antares test flight, using a Castor 30A second stage and no third stage. Orbital Sciences COTS demonstration flight. First Antares mission with a real Cygnus capsule, first mission to rendezvous and berth with the International Space Station, second launch of Antares. The rendezvous maneuver was delayed due to a computer data link problem, but the issue was resolved and berthing followed shortly thereafter. First Commercial Resupply Service (CRS) mission for Cygnus, and first Antares launch using the Castor 30B upper stage. Spacecraft carried supplies for the ISS, including research equipment, crew provisions, hardware, and science experiments. LOX turbopump failure T+6 seconds. Rocket fell back onto the pad and exploded. First Antares launch to use Castor 30XL upper stage. In addition to ISS supplies, payload included a Planetary Resources Arkyd-3 satellite and a NASA JPL/UT Austin CubeSat mission named RACE. First launch of Enhanced Cygnus on Orbital's new Antares 230. Spacecraft carried ISS hardware, crew supplies, and scientific payloads, including the Cold Atom Lab and the Biomolecule Extraction and Sequencing Technology experiment. The Cygnus also demonstrated boosting the station’s orbital velocity for the first time, by 0.06 meters per second. Note: Cygnus CRS OA-4, the first Enhanced Cygnus mission, and OA-6 were propelled by Atlas V 401 launch vehicles while the new Antares 230 was in its final stages of development. Cygnus CRS OA-7 was also switched to an Atlas V and launched on April 18, 2017. The following table shows a typical launch sequence of Antares-100 series rockets, such as for launching a Cygnus spacecraft on a cargo resupply mission to the International Space Station. ^ a b Rosenberg, Zach (April 30, 2012). "Orbital Sciences development costs increase". Flight International via Flightglobal.com. ^ "Surplus Missile Motors: Sale Price Drives Potential Effects on DOD and Commercial Launch Providers" (PDF). U.S. Government Accountability Office. August 2017: 30. GAO-17-609. ^ a b Kyle, Ed (May 14, 2011). "Taurus 2". Space Launch Report. ^ a b c d e f g h i j "Antares (100 Series)". SpaceFlight101. Retrieved May 5, 2016. ^ a b c d e f g h i j "Antares 200 Series – Rockets". spaceflight101.com. Retrieved November 7, 2016. ^ a b c d e "Antares Medium-class Launch Vehicle: Fact Sheet" (PDF). Orbital Sciences Corporation. 2013. Archived from the original (PDF) on June 3, 2013. Retrieved April 25, 2013. ^ a b "Antares - Fact Sheet" (PDF). Orbital ATK. 2017. FS007_06_OA_3695_021317. Retrieved February 12, 2018. ^ a b c d e f g "Antares Medium-Class Launch Vehicle: Brochure" (PDF). Orbital Sciences Corporation. 2013. Archived from the original (PDF) on February 9, 2014. Retrieved April 25, 2012. ^ "Antares". Yuzhnoye Design Bureau. Retrieved November 19, 2017. ^ a b c Graham, William (April 21, 2013). "Antares conducts a flawless maiden launch". NASASpaceFlight.com. Retrieved April 22, 2013. ^ a b Perrotto, Trent J. (April 21, 2013). "NASA Partner Orbital Sciences Test Launches Antares Rocket" (Press release). NASA. Retrieved April 25, 2013. ^ "Orbital Building New Rocket for COTS". Aviation Week & Space Technology. 168 (8): 22–23. February 25, 2008. ^ Beneski, Barron (December 12, 2011). "Orbital Selects "Antares" as Permanent Name for New Rocket Created by the Taurus II R&D Program" (Press release). Orbital Sciences Corporation. ^ a b Queally, James; Hennigan, W. J.; Raab, Lauren (October 28, 2014). "Rocket bound for space station blows up just after liftoff". Los Angeles Times. Retrieved November 8, 2014. ^ a b c Bergin, Chris (February 25, 2008). "none". Space News. p. 12. ^ Chris Bergin (December 23, 2008). "SpaceX and Orbital win huge CRS contract from NASA". nasaspaceflight.com. Retrieved February 22, 2015. ^ Hickey, Gordon (June 9, 2008). "Governor Kaine announces 125 new jobs for Virginia" (Press release). Commonwealth of Virginia via YesVirginia.org. ^ Kennedy, Jack (June 13, 2008). "Taurus-2 Launch Pad to be Ready in 18-Months at Wallops Island Spaceport". Spaceports. Blogspot.com. ^ Glass, Jon W. (February 20, 2008). "Wallops up for big role with firm's NASA contract". The Virginian-Pilot via HamptonRoads.com. ^ a b c Bergin, Chris (February 22, 2013). "Hot fire success for Orbital's Antares". NASASpaceFlight.com. Retrieved February 23, 2013. ^ Beneski, Barron (December 10, 2009). "Second Stage Rocket Motor Of Orbital's Taurus II Launcher Successfully Ground Tested" (Press release). Orbital Sciences Corporation. ^ a b c Clark, Stephen (March 15, 2010). "Aerojet confirms Russian engine is ready for duty". Spaceflight Now. Archived from the original on March 22, 2010. Retrieved March 18, 2010. ^ "Antares User's Guide, Rev. 1.2" (PDF). Orbital Sciences Corporation. December 2009. ^ "Antares First-stage Engines Available Long Term, Aerojet Rocketdyne Chief Says". SpaceNews.com. ^ "SpaceflightNow". Engine turbopump eyed in Antares launch failure. Retrieved June 12, 2017. ^ a b "Orbital's Cygnus – on a SpaceX Falcon 9?". spaceflightinsider.com. November 24, 2014. Retrieved November 28, 2014. Orbital has announced that it is planning to use another engine on Antares and that it will likely not use any more of the 40-year-old AJ-26 engines on the rocket’s next flight – which Orbital hopes to conduct in 2016. ^ "Orbital Sciences likely to choose Russian engine for new Antares rocket". TASS. October 31, 2014. Retrieved October 31, 2014. 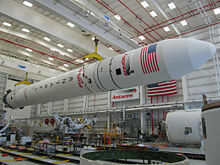 ^ "Orbital Sciences signs contract for new Antares engines". Spaceflight Now. January 22, 2015. Retrieved June 27, 2017. ^ Morring, Frank, Jr. (December 16, 2014). "Antares Upgrade Will Use RD-181s In Direct Buy From Energomash". Aviation Week. Retrieved December 28, 2014. ^ a b "Orbital ATK Team on Track for Fall 2015 Cygnus Mission and Antares Return to Flight in 2016". Orbital ATK. August 12, 2015. Retrieved August 12, 2015. ^ a b c d "Antares Medium-class Space Launch Vehicle factsheet" (PDF). Orbital Sciences. 2014. Archived from the original (PDF) on January 14, 2015. Retrieved December 28, 2014. ^ a b c d e Gebhardt, Chris (1 June 2018). "Orbital ATK looks ahead to CRS2 Cygnus flights, Antares on the commercial market". NASASpaceFlight.com. ^ "CASTOR 30-A Multi-use Motor". Alliant Techsystems. Archived from the original on July 14, 2014. Retrieved July 10, 2014. ^ a b c Bergin, Chris (February 22, 2012). "Space industry giants Orbital upbeat ahead of Antares debut". NASA Spaceflight. Retrieved March 29, 2012. ^ Bergin, Chris (March 5, 2013). "CASTOR 30XL prepares for static fire ahead of providing Antares boost". NASA Spaceflight. Retrieved March 7, 2013. ^ "Antares User's Guide" (PDF). 3.0. Northrop Grumman. August 2018. TM-24022. ^ "Antares Launch Vehicle". Applied Aerospace Structures Corporation. Retrieved April 26, 2014. ^ Warner, Cheryl; Schierholz, Stephanie (January 14, 2016). "NASA Awards International Space Station Cargo Transport Contracts". NASA. Retrieved July 6, 2017. ^ Gebhardt, Chris (February 3, 2017). "Orbital ATK preps Cygnus flights; Antares enhancements on track for 2019". NASASpaceFlight.com. Retrieved July 6, 2017. ^ a b Bergin, Chris (March 17, 2013). "Stars align for Orbital's Antares – A-One debut set for mid-April". NASASpaceFlight.com. Retrieved April 22, 2013. ^ Clark, Stephen (April 21, 2013). "Antares test launch paves new highway to space station". Spaceflight Now. Retrieved April 22, 2013. ^ Krebs, Gunter. "PhoneSat v2". Gunter's Space Page. Retrieved April 22, 2013. ^ Krebs, Gunter. "PhoneSat v1". Gunter's Space Page. Retrieved April 22, 2013. ^ Weil, Martin (April 21, 2013). "Wind postpones rocket launch at Wallops Flight Facility". The Washington Post. ^ Amos, Jonathan (April 21, 2013). "Orbital's Antares rocket makes test flight". BBC News. Retrieved April 22, 2013. ^ a b "Antares explodes moments after launch". Spaceflight Now. October 28, 2014. Retrieved October 28, 2014. ^ a b Wall, Mike (October 28, 2014). "Private Orbital Sciences Rocket Explodes During Launch, NASA Cargo Lost". Space.com. Purch. Retrieved October 28, 2014. ^ Foust, Jeff (November 21, 2014). "Virginia May Seek Federal Funds for Wallops Spaceport Repairs". SpaceNews. Retrieved November 5, 2017. ^ Petersen, Melody (January 3, 2015). "Before explosion, NASA knew aging Soviet engines posed risks". Los Angeles Times. Archived from the original on January 4, 2015. Retrieved January 27, 2018. ^ Clark, Stephen (October 6, 2015). "Workers complete $15 million in repairs to Antares launch pad". Spaceflight Now. Retrieved November 5, 2017. ^ Kramer, Miriam (December 9, 2014). "Private Cargo Spacecraft Gets New Rocket Ride After Accident". Space.com. Retrieved November 5, 2017. ^ "Antares Cold Flow Testing Begins and Antares A-ONE Gets All Dressed Up". Orbital Sciences Corporation. December 2012. Archived from the original on March 6, 2013. Retrieved March 5, 2013. ^ a b Pearlman, Robert Z. (December 9, 2013). "Orbital names next space station freighter for late pilot-astronaut". CollectSpace.com. Retrieved December 9, 2013. ^ "Cygnus launch cargo". Spaceflight Now. 14 September 2013. Retrieved 18 September 2013. ^ Dunn, Marcia (September 22, 2013). "Computer mishap delays space station supply ship Cygnus". The Washington Post. Retrieved September 22, 2013. ^ Bergin, Chris (September 28, 2013). "Orbital's Cygnus successfully berthed on the ISS". NASASpaceFlight.com. Retrieved October 8, 2013. ^ Clark, Stephen (May 6, 2013). "First flight of Cygnus cargo craft delayed to September". Spaceflight Now. Retrieved August 7, 2013. ^ "New Science, NASA Cargo Launches to Space Station Aboard Orbital-1 Mission" (Press release). NASA. 9 January 2014. Retrieved 2 September 2018. ^ "ISS Commercial Resupply Services Mission (Orb-1)". Orbital Sciences Corporation. January 12, 2014. Archived from the original on February 8, 2014. ^ Rawcliffe, Britt (11 July 2014). "After delays, Orbital Sciences Corporation's Antares rocket set to launch". Spaceflight Insider. Retrieved 11 July 2014. ^ a b "Orbital-2 Mission to the International Space Station: Media Press Kit" (PDF) (Press release). NASA. July 2014. Retrieved 2 September 2018. ^ "ISS Commercial Resupply Services Mission (Orb-2)". Orbital Sciences Corporation. 2014. Archived from the original on April 7, 2014. Retrieved July 13, 2014. ^ "ISS Commercial Resupply Services Mission (Orb-3): Mission Update – October 22, 2014". Orbital Sciences Corporation. 22 October 2014. Archived from the original on 25 October 2014. Retrieved 24 October 2014. ^ "Orbital CRS-3 Mission to the International Space Station: Media Press Kit" (PDF) (Press release). NASA. October 2014. Retrieved 2 September 2018. ^ Wilhelm, Steve (October 16, 2014). "First step toward asteroid mining: Planetary Resources set to launch test satellite". Puget Sound Business Journal. Retrieved October 19, 2014. ^ "RACE Mission". Jet Propulsion Laboratory. Archived from the original on October 19, 2014. Retrieved October 28, 2014. ^ "S.S. Alan Poindexter: Orbital ATK freighter named for late shuttle astronaut". collectSPACE. 7 June 2015. ^ "OA-5 Fact Sheet" (PDF). Orbital ATK. Archived from the original (PDF) on 20 October 2016. Retrieved 10 October 2016. ^ "Launch Manifest". Orbital Sciences Corporation. Archived from the original on December 11, 2013. Retrieved December 8, 2013. ^ "Orbital Announces Go-Forward Plan for NASA's Commercial Resupply Services Program and the Company's Antares Launch Vehicle". orbital.com. Orbital Sciences Corporation. November 5, 2014. Retrieved November 5, 2014. ^ Clark, Stephen (October 17, 2016). "Spaceflight Now — Live coverage: Antares rocket returns to flight Monday". Spaceflight Now. Retrieved October 17, 2016. ^ "Cygnus "S.S. Gene Cernan" En-Route to Space Station after Sunday Morning Commute to Orbit". Spaceflight101.com. 12 November 2017. Retrieved 24 May 2018. ^ "Overview – Orbital ATK CRS-8 Mission" (PDF) (Press release). NASA. 2017. Retrieved 2 September 2018. ^ Clark, Stephen (18 May 2018). "Antares rocket rolls to Virginia launch pad, liftoff delayed to Monday". Spaceflight Now. Retrieved 21 May 2018. ^ a b "Overview: Orbital ATK CRS-9 Mission" (PDF). NASA. 2018. Retrieved 23 May 2018. ^ Foust, Jeff (2018-05-21). "Antares launches Cygnus cargo spacecraft to ISS". spacenews.com. Retrieved 2018-05-21. ^ "Antares, Cygnus launch on final CRS1 contract flight; debuting critical new capabilities". NASASpaceFlight.com. 17 April 2019. Retrieved 17 April 2019. ^ Pietrobon, Steven (October 27, 2018). "United States Commercial ELV Launch Manifest". Retrieved October 27, 2018. Wikimedia Commons has media related to Antares (rocket).